“PSC” Ltd, GlobeCore’s partner in Middle East, provides oil reclamation and purification services to Kuwait electric authority. 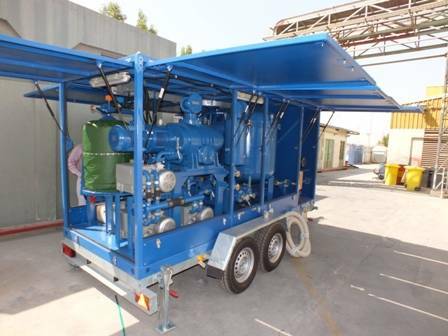 Company plans to extend its services to Saudi Arabia and Qatar with the purchase of this new GlobeCore CMM-R Transformer Oil Reclamation Plant. GlobeCore Sales Manager Jay Pruglo delivers a presentation on Transformer Oil Reclamation and Purification Technology and Equipment in Qatar. “PSC” Ltd, GlobeCore’s partner in Middle East, provides oil recycling and purification services to Kuwait electric authority. Company plans to extend its services to Saudi Arabia and Qatar with the purchase of this new GlobeCore CMM-R Plant for Transformer Oil Reclamation at electricity power substations. Globe Core Sales Manager Jay Pruglo delivers a presentation on Transformer Oil Reclamation and Purification Technology and Equipment in Qatar.